Ralph took me out for breakfast this morning — 46 miles from home in Harris, Minnesota. Fall is definitely approaching. The temperature when we left home was a cool 53 degrees. Time to put on the leathers! Our destination was the Kaffe Stuga, a Swedish-themed roadhouse with to-die-for apple fritter french toast. With its knotty pine paneling and wooden Dala horses and straw goats all around, it’s like going to Grandpa’s cabin! 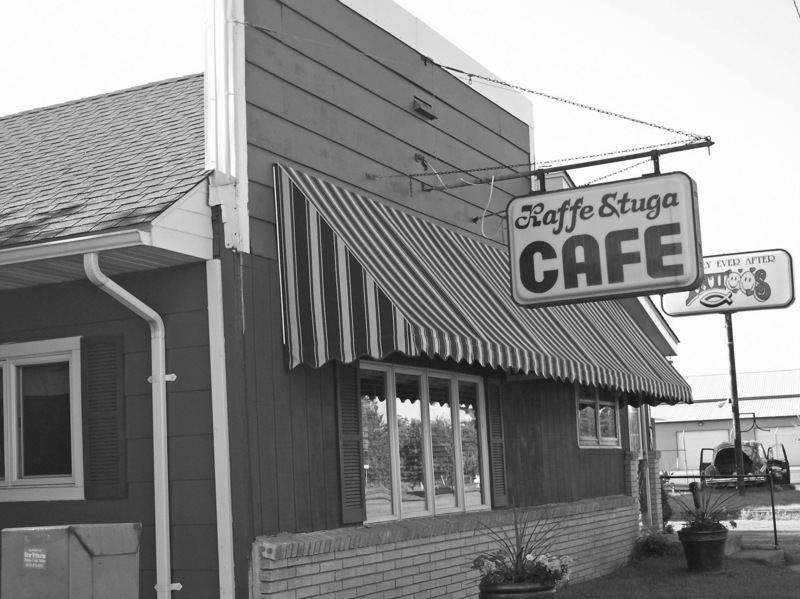 Kaffe Stuga is the place Ralph and I chose for Best Breakfast and is included in my description of Old Hwy. 61 in Ride Minnesota. After a leisurely breakfast, we strolled next door to an antique shop/thrift store where I started my Christmas shopping. (I belong to the “when you see something buy it, because you won’t see it again” mentality.) By the time we hit the open road again, the temperature had climbed considerably. It was a gorgeous day to ride a motorcycle in Minnesota. Riding east on MN 95, we crossed the Sunrise River and encountered a huge crowd of pickup trucks, acres and acres of them, not too far out of North Branch. They filled field after field. Overheard, parasailors floated gently to earth. White tents lined the horizon. Farmers were charging State Fair rates for parking — $10 in one field, $15 in another — and offering shuttle rides via haywagon along the highway. Traffic was slow and go until we reached the entrance to the cause of all the commotion, the Hay Days Snowmobile Grass Drag Races. Our Victory bided its time, the engine rumbling until we broke free of the crowd. We continued on to Taylors Falls and Interstate State Park. Looking across a field of ripening soybeans, we saw a small airplane fly straight up, stall, and dip down toward earth, only to come up and do it all over again. It left a roller-coaster track of exhaust behind it in the clear blue sky. Later, at the park, a small squadron of planes droned overhead, sounding like the Battle of Britain (but without bombs and bullets). The Wheels and Wings car and air show was in full swing in Osceola, Wisconsin. Whether you enter Taylors Falls from the north or the south via 95, you get treated to a curvy downhill run either way. Best of all, both hills meet at the entrance to the park. We stopped at the visitors center and bought a motorcycle pass. The passes are just $20 and they allow you into every state park in Minnesota for a year from the date of purchase. It’s a heck of a deal. We wound up our ride by cruising through Stillwater and observing the construction of the new bridge over the St. Croix River. The pylons are already in the water. It won’t be long until it’s open to traffic. I can’t wait to put on my leathers again and go riding. Maybe we’ll make it to Lake Itasca and the Lake Country Scenic Byway this year after all! Posted on September 6, 2014, in Minnesota, Motorcycles, Ride Minnesota, Victory motorcycle and tagged Harris, Hay Days, Interstate State Park, Kaffe Stuga, Lake Country Scenic Byway, Lake Itasca, Minnesota State Parks, motorcycle pass, Snowmobile grass drags, St. Croix River, Taylors Falls, Wheels and Wings. Bookmark the permalink. Leave a comment.